North Carolina Lhasa Apso Rescue View other Lhasa Apsos for adoption. I will be very picky finding her a new home. Rescues are welcome to contact me for her too. Masha needs to be an only pet! No exceptions-she will attack other dogs and pets. She gets jealous and aggressive when other animals are in her house. She does not get along with any dogs. Not good with cats, birds, rats, or any other animal. She is not good with children. She also does not like being groomed. I suggest taking her to a professional groomer when she needs a haircut or invest in a grooming table so she can't run off. She is very sweet and cuddly with her owner, well behaved and a joy to be with. She loves playing with her ball toys and basking in the sun. She sleeps in bed with me and loves to cuddle. She travels really well in the car sitting on your lap. She has also flown in cabin of airplanes four times and she did really well, she fell asleep after takeoff. She is potty trained for outside but will also use pee pads. She gets nervous in loud or crowded places, she didn't enjoy going downtown, she hid in her bag the whole time. She's not a fan of water, I took her kayaking and she sat still and was dry the whole time but given a choice she would've stayed out of the water, she doesn't like being wet or swimming. She knows sit, dance, and speak (which is a whisper not a bark). I want her to find her forever family. I would like a few updates of her in her new home. I love her very much and will be very picky choosing her new family. If you have children or plan to have children, this is not the dog for you, she will bite them. She must be an only dog. 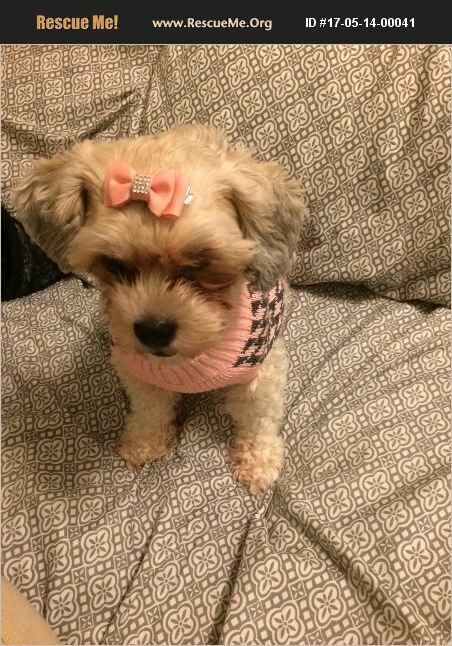 She is Lhasa apso poodle mix, 2yrs old, 9lbs. I'd be happy to talk more about her and explain her behavior. If interested please email, call, or text.